we’ve all seen these glorious posts and rave reviews about oil pulling, yes? my question has always been “where is the RESEARCH?” you can show me all the blogs in the world, but i’m gonna need some facts. let’s look at this whole oil pulling craze and see if the benefits reach beyond having a healthier mouth! oil pulling stems from Ayurvedic oral care. it’s first mentioned in the Charaka Samhita, which is a key text of Indian traditional medicine. it’s done by swishing a spoonful of oil around your mouth for about 20 minutes. it’s done first thing in the morning, every day, as a part of an oral health routine. the oils that can be used are sesame and coconut oil as the 2 main contenders, with sunflower and olive also usable. it does NOT replace brushing your teeth! oil pulling is widely touted as an all-natural way to promote overall oral health, whiten teeth, ward off gingivitis, fight plaque build-up, and help with teeth sensitivity. from the articles i’ve seen, oil pulling is just a PART of improving health (like reducing strep mutagens after 2 weeks... which i’m skeptical of because your body will be fighting it off in that time regardless… and let’s also be polite and say there’s some heavy researcher bias in that study). so far the research doesn’t show that it’s oil pulling that improves health. does it DETOX you? NO. that part is a huge load of crap. we have these really cool organs called livers and kidneys that do that for us. pretty neat! so how does it work? oil pulling works by helping to support a healthy oral environment. it’s just another way to clean your mouth. it’s a small part of an overall routine. that’s it! with a cleaner, healthier mouth, your body can focus on other things. it’s a complete domino effect. 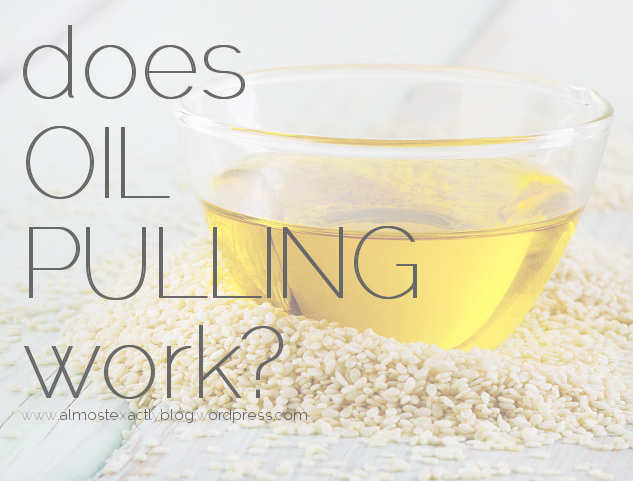 oil pulling isn’t magic! your body is magic. simple. so what does this mean? you can certainly see oral improvements. absolutely. but what you won’t see is a liver detox. in other words, it’s not the fact that you’re oil pulling that’s the only thing at play. oil pulling (as with proper flossing, proper brushing, and mouth rinses as needed), can be a PART of a healthy oral care routine, that in turn helps you be a healthier person overall. Let’s be clear. i am not discounting the oral benefits you can see from adding oil pulling to part of your oral care routine! i’m very aware those benefits are real. if you’re seeing benefits, and your health care professional supports it, keep at it! what i AM asserting is that oil pulling is Not magic. it does not detox you. it does not cure bodily ailments completely on its own. but rather, by oil pulling, you’re making your mouth healthier, which in turn makes your body healthier. the research indicates that using a healthy mouth rinse is JUST AS effective as oil pulling! correct! you’ve improved your oral health care routine. of course you will see those benefits, barring you’re not allergic to or sensitive to the oils you choose to use. that’s because you’re swishing a naturally anti-bacterial oil in your mouth that’s full of awesome things that support a healthy oral environment. and while you’re swishing, you’re also dislodging food particles that would have otherwise been stuck. that combined with the antibac action your mouth is gettin can be attributed to your improved mouth. bottom line, you can put some coconut oil in your mouth when you brush your teeth and floss properly, and get the same whitening/antibac effects. if you can’t swish oil around in your mouth for 20 minutes, don’t worry! i personally can’t stand swishing oil around in my mouth for that long. i get gaggy. use healthy mouth rinses. no alcohols, no dyes, no SLS, etc. do i personally recommend oil pulling? please make your own educated decisions with the help of your health care professional. lots of people have had great results by oil pulling, ranging from whitened teeth to lessened tooth sensitivity. in the meantime, let’s agree to stop saying oil pulling detoxes you and cures allergies and lessens your PMS symptoms. okay? okay. we CAN say it promotes a healthier oral environment when used in conjunction with proper brushing/flossing. if you’re seeing decreased tooth sensitivity, whiter teeth, etc., keep doing it! it’s the fact that your mouth is healthier that’s making everything better. no reason to stop! do we have any success stories? any failed attempts? **FOR THOSE OF YOU WITH DENTAL FILLINGS – (me, too!) it has been reported that oil pulling does loosen up fillings. please talk to your dentist first if this applies to you! I personally really like doing the activated charcoal pulling instead of oil, even though you can combine the two! It’s easier to swish around in your mouth if your face muscles are weaker or more sensitive and great for your oral health. And yes you can swallow some of it too if you need to, or by accident. Haha! I like to do this and then wait a few minutes after spitting out the rinse with the leftover still on teeth, and then brush with toothpaste to get the benefit of the charcoal and brushing teeth without it being too abrasive (which I have heard some people worry about if you use it just to brush your teeth). I just started using home made tooth paste. I added calcium citrate with magnesium and vit d.
Magnesium from magNesium Citrate 400mg. Is this alright for my teeth. It effervescent on the brush when I add water. Thanks, I appreciate your approach! I do oil pulling with CO several times a week, and agree that it helps oral health. The one thing that’s different in my experience is the supposed side effect of sensitive teeth. I would say it’s the other way around – if one of my teeth gets sensitive, it’s usually when I’ve been remiss in oil pulling, and a day or two of oil pulling gets rid of the sensitivity. I swish sesame oil a few times a week for a few minutes. I also floss and brush regularly. I haven’t experienced anything that oil pulling claims to do but I keep doing it because I like the way my teeth feel afterwards. They just feel cleaner than with normal brushing and flossing (which I still do as well as oil pulling). pssh, water under under the bridge indeed! also, i will include those as links in the post if you don’t mind! hey kathleen! i love that you included these! the 3rd article you linked shows the results when oil pulling is COMBINED with using a salt water mouth rinse, which we know further supports a healthy oral environment. How do you feel about swishing with diluted hydrogen peroxide? I have heard differing things about it, and I would love to have your opinion. I tried oil pulling but 20 minutes seems like forever. My patience isn’t that great. lol! I personally love oil pulling. I thought I would deal with the gagging, but never have and it really does help clear my sinuses and make it easier to breathe. It’s made my teeth whiter than they’ve ever been and I simply don’t need to brush my teeth more than once a day (usually right after I pull) because they don’t get as dirty and have no plaque. When I’ve run out of oil or had to take a break I really can’t wait to get back to it. Do I think some of these claims are a little over the top? Sure! But I would still suggest this to anyone. Great timing! My sis just recommended swishing coconut oil & I was thinking “Oh, really? 20 minutes? That sounds……. like I’ll probably never bother.” It was nice to read a little more about it & now I feel satisfied that there is CO in my homemade toothpaste! Thanks!